Quick–think of a fantasy book written for early elementary aged kids of 8 or so, where the fantasy stars a group of minority kids and takes place in an urban neighborhood where gangs and abandoned properties are big problems, just like they are in many place[s] in real life, and where the fantasy part itself is something truly beautiful and magical and hopeful…. 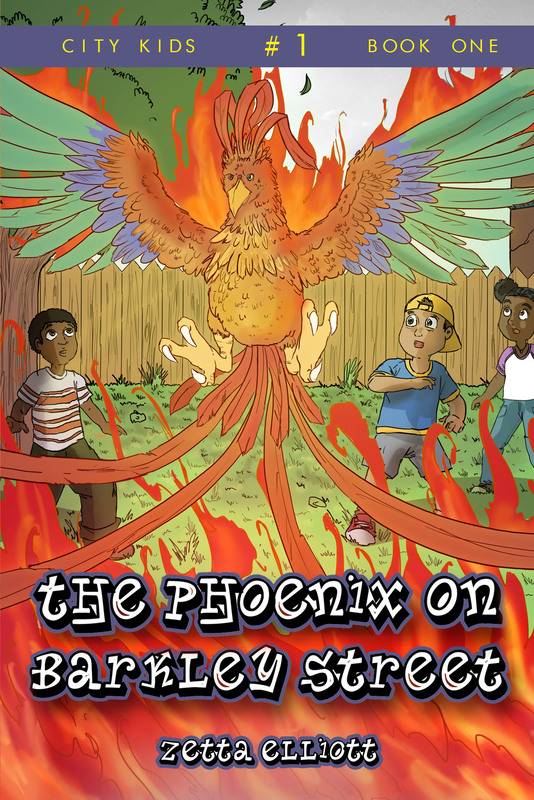 I can think of one, because I just read it– The Phoenix on Barkley Street, by Zetta Elliott (self published, August 2014, ages 7-9), and tomorrow I will take it to a Little Free Library that is in just such a neighborhood, and hope that it falls into the hands of young readers who haven’t yet been told that magic can happen to kids just like them. So it’s a good story, and the writing is just right for a third or fourth grade reader getting their reading legs under them, as it were, and yay! for diversity and urban fantasy targeted at this age group. And yay! for kids of color in fantasy books for elementary school readers–I think it’s awfully important to have lots of these, so that ever[y] kid can be given a place at the table of the imagination, and there really aren’t many at all. Once you know that you can be in a fantasy story, you can allow yourself to dream whatever you want…..